Gov. Pat McCrory is among the nation’s more conservative Republican governors, according to Nate Silver, the political blogger and prognosticator for The New York Times. In an article about the nation’s 30 Republican governors, Silver attempts to measure them on their conservatism – no easy task since they don’t have a voting record like members of Congress do. But Silver measures them based on public statements, the identity of their donors, and where applicable, their congressional voting record. He rates McCrory as the ninth most conservative Republican. He is more conservative than Texas Gov. Rick Perry, Kansas Gov. Sam Brownback, Louisiana Gov. Bobby Jindal, South Carolina Gov. Nikki Haley, Florida Gov. Rick Scott, Ohio Gov John Kasich, Tennessee Gov. Bill Haslam, Michigan Gov. Rick Snyder and Alabama Gov. Robert Bentley, among others. To McCrory’s right are Virginia Gov. Bob McDonnell, South Dakota Gov. Dennis Daugaard, Iowa Gov. Terry Branstad, Mississippi Gov. Phil Bryant, Georgia Gov. Nathan Deal, Wisconsin Gov. Scott Walker, Indiana Gov. Mike Pence and Idaho Gov. Butch Otter. I surprised by some of the names. For example, I would have thought that Rick Perry and Bobby Jindal would have been to his right. Same for Kasich and Rick Scott. On the other side, I would have guessed McDonnell, Branstad and maybe Pence to be more liberal. Not sure what it means, especially since McCrory has only been in office for less than 4 months, but….Nate says so. 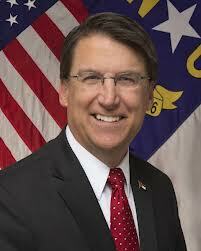 This entry was posted in Politics: National and tagged Nate Silver, Pat McCrory. Bookmark the permalink.